Announcement Cheers to the perfect Mother's Day gift! We love helping our customers create the perfect custom order to suite their needs; please contact us for information regarding custom or wholesale orders. Cheers to the perfect Mother's Day gift! We love helping our customers create the perfect custom order to suite their needs; please contact us for information regarding custom or wholesale orders. The green looks yellowish. But they look pretty cool. I'd post a pic, but I'm not given the option. It is wind chime season and we are constantly adding fun now options to create the perfect addition to your favorite outdoor space! Check them out today! We have added lots of new pendant options! Check them out before they’re gone! 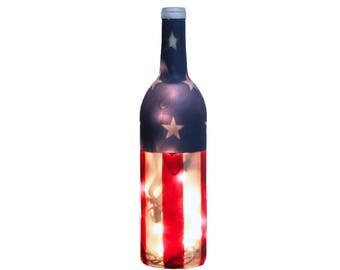 Customizing some flag lighted wine bottles. I love custom orders that make me flex my creative muscle and create something uniquely personal! Antique mason jar experiment gone right. Custom wine decor specializing in creating unique gifts to light up any occasion! Welcome to Classy Garbage. We are so glad you are here! At Classy Garbage, we love to light up the extraordinary within the ordinary. 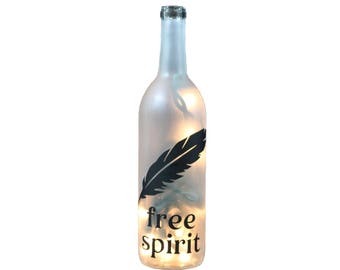 We take recycled wine bottles and carefully handcraft them into one of kind wine decor pieces and gift items. With an emphasis on attention to detail and 5-star customer service, we pride ourselves on always providing our customers with the best quality handmade products possible. We strive to always ship an item that you will love to display in you home, feel proud to give, and that the loved ones on your gift list will be thrilled to receive. Whether you are looking to add a simple, yet sophisticated, splash of class indoors or out, we look forward to creating the perfect wine decor to fit your needs. 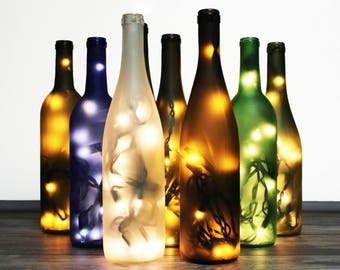 From wine bottle wind chimes to lighted wine bottle lamps, we are always happy to help you create the perfect piece to suite your tastes. We look forward to creating for you! Cheers! Chelle's main focus in life has always been music, art, practicing authenticity. A big fan of nature, making and eating food, and caffeine. I like few things more than nature, coffee, music, my kids, my favorite guy and flexing my creative muscles. Smooch is a smaller, cooler version of myself. You can find Smooch stealing hugs, painting or drawing nearby. She is a great helper and also gives very good hugs when I am feeling discouraged. She is also my go to art critic. Cole is the brain power of the group. This guy keeps us entertained with his endless "did you know's" & amazing ideas. Cole is an awesome helper and I don't know what I would do without his extra set of hands and willingness to help. Willow is always down to help and stick like glue to my side. Whether I am painting, drilling, dropping orders off or picking bottles up, Willow isn't happy unless Willow is there too. Rufio is fat, lazy, spoiled & naughty. You can find him sleeping in places he shouldn't be, eating things he shouldn't, killing plants, knocking things over (like full cups), attacking us & splashing all the water out of his bowl. We love him anyway. We strive to offer excellent service to all of our customers so that you can have the best Etsy experience possible. If you have any questions regarding items, shipping, payment, etc... please do not hesitate to contact us and we are more than happy to answer your questions as quickly as possible. Please note that a 20% restocking fee will apply to all returned items. Buyer is responsible for return shipping costs. Items must be returned in new condition with original packaging. This shop accepts all major credit cards, Etsy gift cards and PayPal as payment. All listed items are made to order and most are shipped within 1-5 days of purchase. Please check specific listings for more details and exact times. Custom orders will receive a processing estimate at the time of purchase. We strive to ship orders as quickly as possible while maintaining the high level quality of work that each order deserves. In the case that an item is damaged during shipping, it must be reported to seller within 3 days of scheduled delivery date (corresponding to the provided tracking number). Please submit photos of the damaged items and the box they were shipped in as well as a contact number to be submitted to the USPS. The replacement of damaged items will be processed, at no cost to the customer, once we have received the request and correct documentation to file a claim with the USPS in a timely manner. All orders are shipped via the USPS Priority Mail 1-3 day delivery, and insured. Classy Garbage is not responsible for shipping carrier delays due to extreme weather, holidays or unforeseen issues relative to the shipping process. We will always do our best to accomodate your preferences but the specific shade of color (such as brown or green) is dependent upon what we have available at the time. Specific shade is not guaranteed unless you verify it with our shop before purchase. Are the lights electric or battery operated? 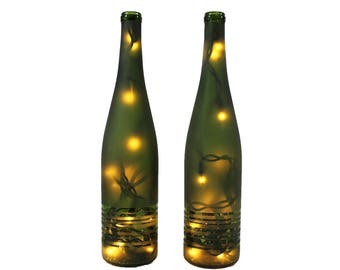 The lights that come standard in our lighted wine bottles are electric. Battery operated options are available at an additional charge by custom order. Please contact us for more information and we will be happy to help you with a custom product to suit your needs. We love to create custom orders to fit your unique needs! Contact us for more information, or with your ideas and questions, and we are happy to help you create the perfect piece to meet your needs. As our products are fragile in nature, please discard of product at any sign of wear or damage. Never reach your fingers or hands inside of glass wind chimes or holes drilled into bottles under any circumstances. These surfaces are professionally sanded but not intended to be handled purposely against the skin. For bottles with a frosted finish, avoid any abrasive contact which may scratch or damage the finish of your item. Due to the fragile nature of our products, things happen on occasion and an item may get damaged during shipping. Fortunately, this is not at all common, and all of our products are shipped via Priority Mail which includes insurance. If your item is damaged during shipping, please be sure to contact us within 3 days of delivery, including a photo of the package and/or damaged product, and a contact number that we may provide the USPS. Once we have this information in a timely manner, we will ship you a replacement immediately, at no cost to you, and handle the claim with the USPS for you! We strive to make this process as quick and hassle free for our customers as possible. What if one of the light bulbs goes out? If one bulb goes out, then one bulb goes out. That's it! We pride ourselves on only using the highest quality supplies and materials when creating our items. In the event of a bulb going bad, the other bulbs will, indeed, remain lit, and you can continue to enjoy your lighted bottle without a problem. While we do not currently offer a gift wrapping option at this time, we do offer a complimentary gift note in place of our standard packing slip. If you would like to take advantage of this option, please make this request in the order notes during purchase, and include any brief message you would like included on your gift note.